NEW YORK, NY— The term "outdoor plumbing" may prompt unpleasant memories for anyone born before bathrooms moved indoors, but modern homeowners might want to consider adding exterior water service for convenience all around their homes. Most homes are provided with just one water source for outdoor needs - typically a sillcock, or spigot, located near grade level on the side or back of the house. This single outlet is there to be used for a multitude of purposes, from watering lawns to gardening to washing the car. Anyone who has ever dragged a garden hose around a yard to handle chores like these will see the value in installing additional outlets where they can be most useful. Most homes have copper plumbing, and it's not difficult or expensive to permanently extend plumbing lines already in place. Copper is recommended for both indoor and outdoor use. The convenience of having water wherever you need it makes this project more than worthwhile. 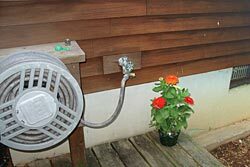 For example, if you do container gardening on a deck or patio, having a water outlet close at hand enables you to run drip irrigation lines directly to each container without needing a garden hose when you want to water your plants. It also prevents having to monopolize the hose when it is needed for other chores elsewhere around the home. And once you install a permanent water line to this area, you can use it for other needs such as washing up after gardening or for food preparation if you barbecue or dine outdoors. Homeowners who prize their lawns know that watering is often required, and having a dedicated outdoor spigot for this purpose can save both time and money. 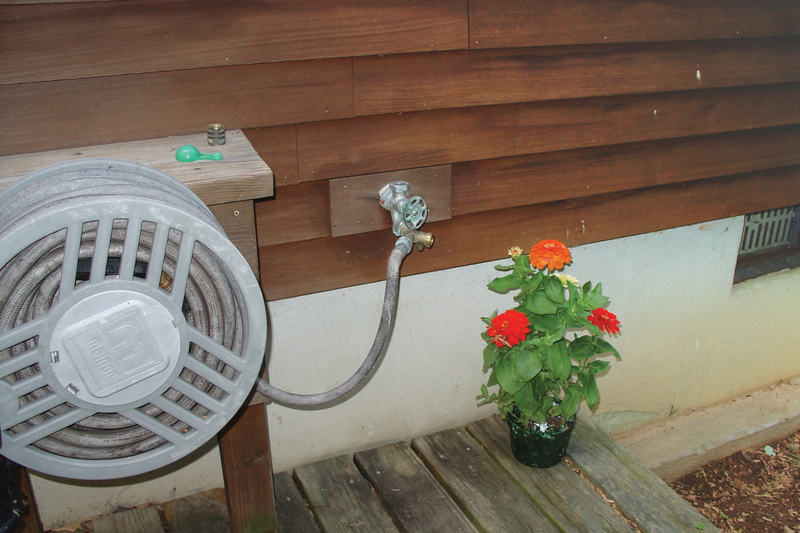 If your watering needs are intermittent, a separate spigot allows you to install a hose timer that you can set and forget, and never have to bother with connecting or removing the sprinkler hose. And if you have, or plan to install, an in-ground sprinkler system, a separate spigot is usually necessary. For homes with sizeable properties, installing an underground water line and spigot at the far end of your yard can save you an enormous amount of effort, and help you avoid buying extra lengths of garden hose and hose carriers. Another good reason for installing additional sillcocks or spigots where you need them is to make outdoor cleanup easier in seasonal weather. In this case, you might consider running both cold and hot water lines to the outdoor faucet. Adding a second line is just as easy as the first. You can then use this outlet for an outdoor shower (especially useful if you own a pool), for washing cars, kids or the family dog, or for power-washing your home's siding or patio. If you do install additional exterior water outlets, a few items of importance should be noted: Use freeze-proof sillcocks to prevent mishaps, if temperatures in your area can drop below 40 degrees. Always include a shutoff and drain valve for each exterior line in a frost-protected area such as a heated basement or garage. All water lines should be pitched at a slight angle so they will drain completely. Alternatively, compressed air may be used to purge water from the lines at the onset of winter or any time freezing may occur.